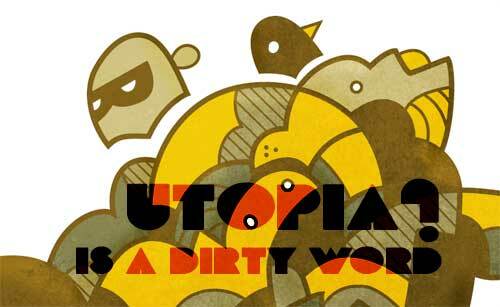 A collection of pieces from the very successful Utopia is a dirty word? show. It was my first solo show, though I had the great opportunity to work on some collabs that were featured. These featured pieces were completed with Erik Stow or the very talented Dustin Chesnutt. So this is it, the culmination of all the work I have done this summer. I am still working on a couple of pieces in typical architecture procrastination last-minute style, but I think the show will be flush with material. Look forward to subsequent posts detailing the work in the show with attached prices!! This is an old one that may be my most successful piece using only Illustrator. Credit for the font layout goes to the L in L & J Designs.